Our reputation in the market is largely attributable to our precisely designed and manufactured General AUX Roti Make. 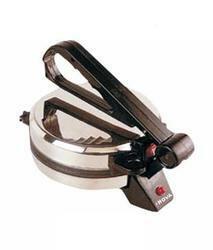 Our offered roti maker is available in various sizes and designs in order to cater the demands of our clients. Widely used for making roti and also makes roti from bajra, maize, rice flour etc., provided qualitative roti maker is precisely designed by using optimum quality components and ultra-modern technology in sync with industry norms by our vendor’s professionals. The first ever chapati maker with Metal Body. Rools and cooks roti less than a minute. also makes roti from Bajra, Maize, rice flour etc. We compete effectively in today's global business environment by constantly delivering cost competitive and high quality General AUX Steel Body Roti Maker. A great boon to working women and housewives, offered roti maker is manufactured under the vigilance of our vendor’s professionals using premium quality components and modern technology as per the set industry norms. Apart from this, provided roti maker is widely praised in the market for various quality features like easy to clean and low energy consumption. The first ever chapati maker with Steel Body. Key Product Description There are many elements that make a satisfying meal and primary among them are the accompaniments like hot puffed up rotis. However, unless very experienced making rotis can prove to be quite challenging. Besides, our busy lives do not leave us with the luxury of time either. 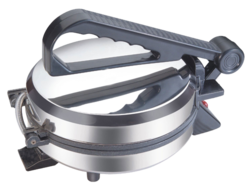 But now, with the General Aux stainless Roti Maker you have the option of making rotis for your family effortlessly. Available at a best price, this will be a great buy from General Aux. Looking for Roti Maker ?